7,489 miles West to the Pacific Ocean we travel from Nepal to Samoa. Somewhere again that we really want to visit, but alas we haven’t and so far no plans to do so. However, it can be added to the bucket list…. Formally Western Samoa, Samoa is a Sovereign State in Polynesia in the South Pacific Ocean. Independence from New Zealand was in 1962. The two main islands are Upolu and Savai’i, which is the biggest Island in Polynesia. The capital is Apia and is on the Island of Upolu. In 1976 Samoa was accepted into the United Nations (UN). Before the 20th century the entire Island Group was called “Navigator Islands” a name given to them by European explorers because of the Samoans’ seafaring skills. Samoa is a very interesting country to research and more history info can be found here. The traditional culture of Samoa is based on Fa’a Samoa, and is a communal way of life. In Samoan culture, lots and most activities are done together and Faith, Family and Music are the three main parts of Samoan culture. The Samoan people have lived off the land for hundreds of years, chiefly as hunters, gatherers, farmers, and fishers. This lifestyle remains somewhat true even today as the people are at least moderately reliant on the land and seas. However, more important to the people in the past and today are community and family as many people live in rural areas where most people know each other. Samoa is a group of islands in the South Pacific, home to some of the smiliest people in the world. Samoan people love to joke around, sing, dance and are serious about three things in life: God, family and food. Sundays are conventionally a day of rest, and like here in “my world” in the UK, many families congregate to share an umu together for a Sunday afternoon meal. A little like us all meeting for a traditional Sunday Roast. It is customary the older members of the family will sit and eat first, and as the meal continues the younger members and then children are invited to eat. The umu contains a profusion and mixture of dishes ranging from a whole pig, fresh seaweed and crayfish to baked taro and rice. Coconut appears in many Samoan dishes, for example palusami, a parcel of coconut cream wrapped in taro leaves baked in the umu. When these first settlers did arrive, they found plenty of animals in the surrounding seas that were, and still are, used for the people’s diet, including crabs, octopus, turtles, fish of all kinds such as tuna, and sea birds such as noddies and terns. The formalities and most important aspects of dining in Samoa are related to behaviour more than actual eating. As an example, bringing food to a dinner, even a small side dish or dessert can cause great offense to the host by indicating they will not prepare enough food for everyone. Also let your host seat you as guests are also often asked to sit in the middle of the table so they may converse with everyone more easily. Once everyone is seated it would be very noticeable there would be a lack of cutlery as most/many Samoans eat with their hands. 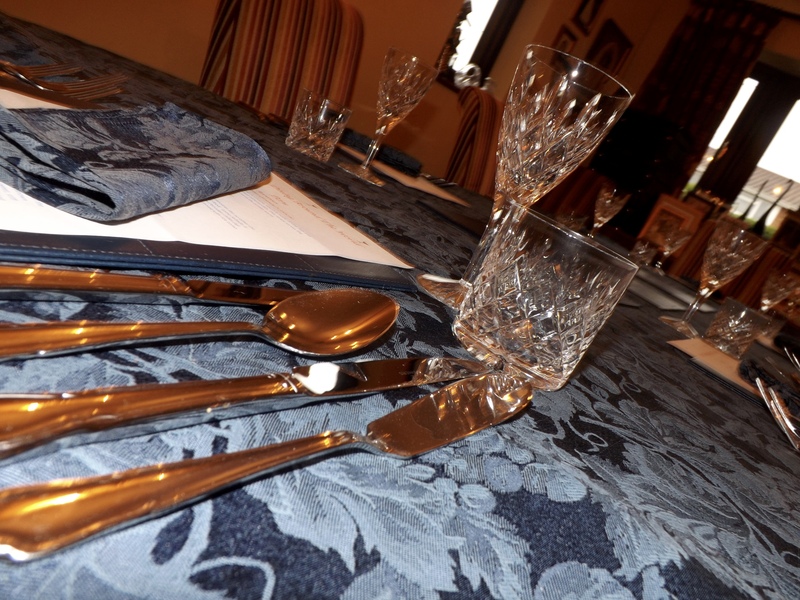 It is important that you follow suite….We used cutlery at our dinner party. Taking a second serving of food is considered rude, therefore it is important that you have planned what you wish to take before starting to eat and it is very important to try every dish that is offered. This is a sign of respect and appreciation to your host. You mustn’t eat until signalled to do so, even though your host would expect you start first and it is so important to eat at the same pace as everyone else. Most of the people will leave some food behind then will take their excess food home for a latter meal. You are welcome to do the same, but as a guest your host may insist you finish all of your food. Table laid my attention turned to the kitchen and I wanted to make the evening as authentic as possible. The republic of Peru is situated in Western South America, to its West The Pacific Ocean, South is Chile, Bolivia is to the Southeast, Brazil to the East and Colombia and Ecuador to the North. Peru is an enormous biodiverse country with environments extending from the “dry plains” of the “Pacific Coastal Region” in the west to the pinnacles of the Andes mountains spreading from the North to the Southeast reaching the tropical Amazon Basin rainforest. Peru is divided into 25 regions and is a representative democratic. A country that is developing with a high Human Development Index score. The predominant financial activities comprise of agriculture, fishing, manufacturing and mining. There is a population is approximately 30 million and is very multi cultural which include Europeans, Amerindians, Asians and Africans with Spanish being the chief language spoken. However, there are a considerable number of Peruvians speaking indigenous languages. Because of the combination of traditional customs Peru is widely varied in areas such as literature, music, art and cuisine. Peru has fantastic gastronomy and this has grown equally from immigrant and local customs. Foods enjoyed and cooked by ancient customs are still enjoyed in today and also profit from African, Asian and European influences. The natural characteristic “harvests” of Peru is very mixed with, the greatness of seafood, potatoes, grains and tropical fruits. Peruvian food has really expanded over the world and equally is loved on all parts of the globe, thanks to its fresh and exceptional flavours and meals are never rushed. The staples of indigenous Peruvian cuisine are corn, potatoes and chillies, and these have prevailed through centuries of colonial rule and immigration. 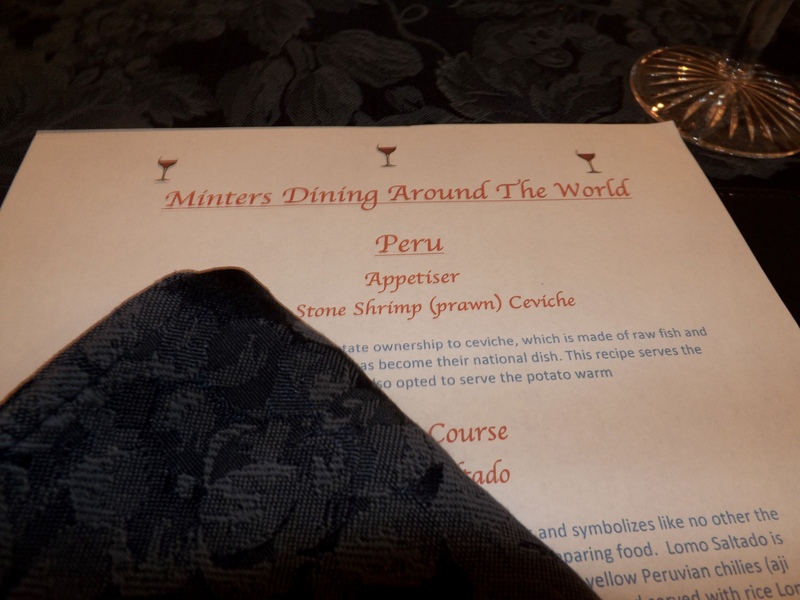 The amount of food being served at a dinner party in a Peruvian household,because of their class, is normally large amount, even by US standards. Potatoes and rice will be served along with bread and other starches. On completing your meal you would place your cutlery diagonally across the pate, with the points facing to the 10 O Clock position on the plate. The host and the honoured guest usually sit next to each other (males to the right of the hostess, and females to the right of the host); if there is a hosting couple they usually sit together. For our dinner party we/I opted for some traditional Peruvian food and hopefully we will do it justice and our friends will love what we have offered them..
Our appetiser/starter is a Hot Stone Shrimp(Prawn) Ceviche – Peru is one of the countries that states ownership to ceviche, which is made of raw fish and chilies, cured in lime juice and it has become their national dish. It has been one of South America’s best-kept secret for centuries, but Ceviche has become a very trendy starter/appetiser. The birthplace of Ceviche is argued between Ecuador and Peru, but with both countries having wonderful varieties of seafood, it could have come from either from the ancient Incas. Each South American country has given the ceviche a twist of its own by adding extras. Sri Lanka until 1972 was known as Ceylon. 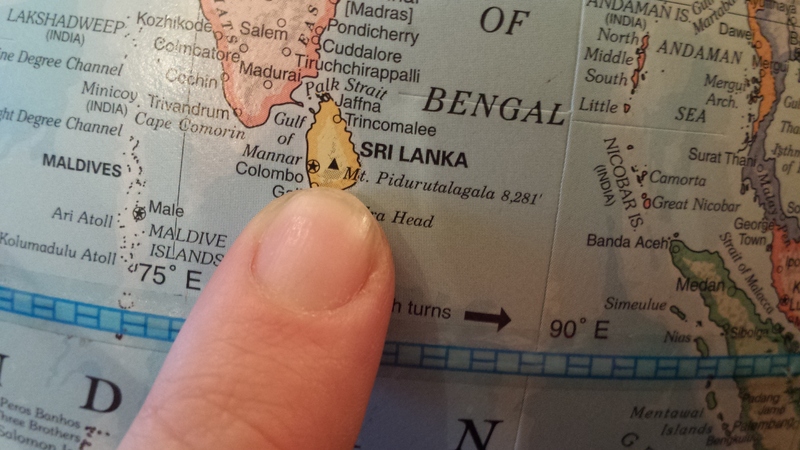 Now officially the Democratic Socialist Republic of Sri Lanka, is an island situated to near South East India. It’s nautical borders are the beautiful island of the Maldives to the South West and India to the North West. There is recorded history spanning 3,000 years and there is allegedly evidence of pre historic human settlements that date back around 125,000 years. From as far back as the ancient silk road round to WWII Sri Lanka’s location and its deep harbours made it of tactical importance. Sri Lanka is home to many languages, religions and ethnic groups, which makes it the varied and diverse country. The ethnic group native to the island, and in a majority are Sinhalese. 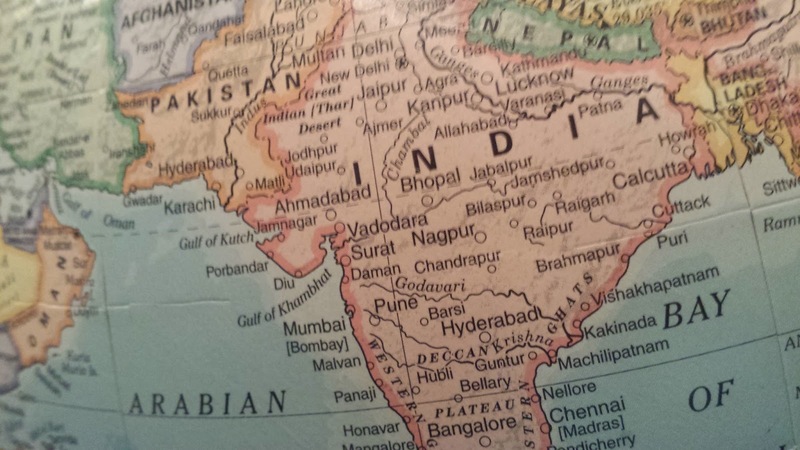 However, it is home to many other groups such as the Indian and Sri Lankan Tamils, Kaffirs, Moors, Malays, Burghers and the aboriginal groups Vedda. There is an intense Buddhist tradition and as early as 29 BC, Buddhist writings of Sri Lanka can be found. Ending in 2009 was the 30 year civil war that had blemished the county; the Sri Lankan military defeated the Liberation Tigers of Tamil Eelam. The capital and largest city is Colombo and the country is a significant producer of rubber, gemstones, coconuts, coffee, tea and the native cinnamon. The island has varied landscapes with a variety of different types of life found on Earth and the variations within species – Biodiversity. The cuisine of Sri Lanka can be either very mild or hot and can also be a combination and curries come in many varieties of flavours, colours and varieties. 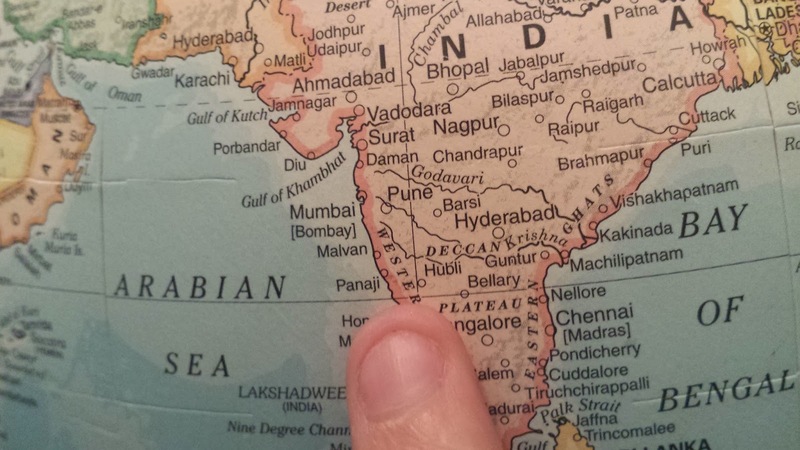 There are sways from colonial powers, Southern India and foreign traders with some of the main ingredients being coconut, rice and spices this being due to the history of the island being a producer of spice and trading the spices over several centuries. The food is very much a question of personal preference, but unique to their culture and plays an important part for the islanders. They make sweets with coconut milk and make milk rice. many Sri Lankans eat vegetables, but rice and curry is the main food with their firey hot flavours. Coconut milk is a very distinct feature and different regions specialise in different types of dishes. Though famous for producing another pantry staple, black tea, Sri Lanka is also a key producer of high quality pepper. It is an essential ingredient in Sri Lankan cuisine, used in the spice blends of curries, such as this one, added to pickles and relishes, and even cracked over fresh tropical fruit with salt, sugar and chilli. 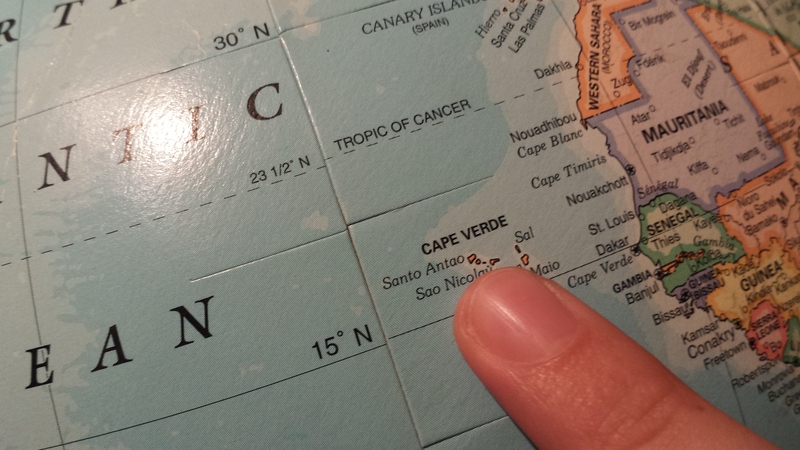 Today is Sunday and our family is only three today, but as promised we set the globe spinning and Rory landed on Cape Verde…Just to the left of it actually, but we said we would go to the nearest place. Somewhere I would love to go and have added it to my dream board. I am told it s very BEA – U – TIFUL….. Please let me know if you have been. The Island of Cape Verde is an archipelago of islands in the Atlantic Ocean. Known as the Republic of Cabo Verde, there are 10 volcanic islands which are approximately 300 miles off the West Coast of Africa. The Islands themselves cover a little over 1.5 thousand square miles. Until the 15th Century Cape Verde was not inhabited then the Portuguese explorers came across the islands and decided to settle. The Islands were perfectly situated for the Atlantic slave trade and the islands grew with great wealth through the 16th and into the 17th century, and they enticed privateers, merchants and pirates. At the end of the 19th century saw the end to slavery but this then led to an economic decline and inhabitants leaving, although Cape Verde did eventually recuperate and became a significant business area and a stop off for ships en route to somewhere else on the globe. In 1951 it was combined as an overseas division of Portugal and then in 1975 the islands eventually became independent after much campaigning and since independence Cape Verde continues to be a steady and to be one of the greatest grown countries in Africa. Cape Verde has approximately 500,000 in its population and are of African descent and mixed European. The cuisine on Cape Verde is varied and its dry environment and also Portugal’s settlement have influenced its cooking traditions. The Africans, that were part of the slave trade, gave knowledge of cooking the tropical crops, then the Portuguese brought cattle.. Cape Verde was used as a trial place for growing food such as Peppers, Pumpkins and corn also feed sailors from sailing ships passing through. Foods such as bananas, sugar and tropical fruits were relocated from Asia…In Cape Verde there is a profusion of freshly caught seafood including wahoo, bica, tuna and lobster. As previously mentioned Ian was delighted with tonight’s choice and where the finger landed. 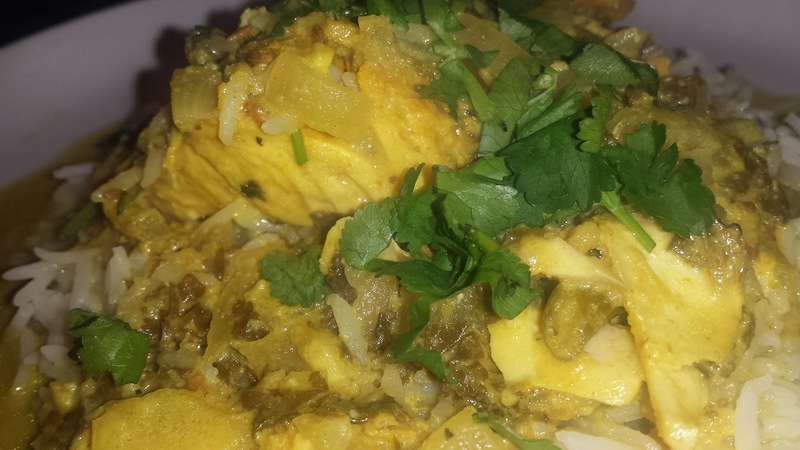 Curry, Indian curry, has to be one of Ian’s favourites. I too like it very much now, but until I left home in 1983 had never had a curry of any description. Panaji is one of India’s most relaxed capitals it is also one of the smallest and is still known world wide by its former name Panjim which originates from Portugal. It is situated on a Peninsula over looking the “Mandovi River”. Here cruise boats can be found, floating casinos, which all reflect in the water. Food found in Panaji is all about Goan cuisine, which provides for different tastes, which vary from western fundamentals to beautiful authentic Goan food. This could be dishes like fish curry and steamed/boiled rice to vegetarian options like khatkhatem, mushroom tondak and foogath, among others. Nearly all Goan dishes are mixed with different aromatic herbs and spices, chilli, coconut (milk)turmeric, cumin to name a few… familiar dishes like Pork Vindaloo can be found in Goa along with vegetable stews that have a mix of sweet and powerful flavours. 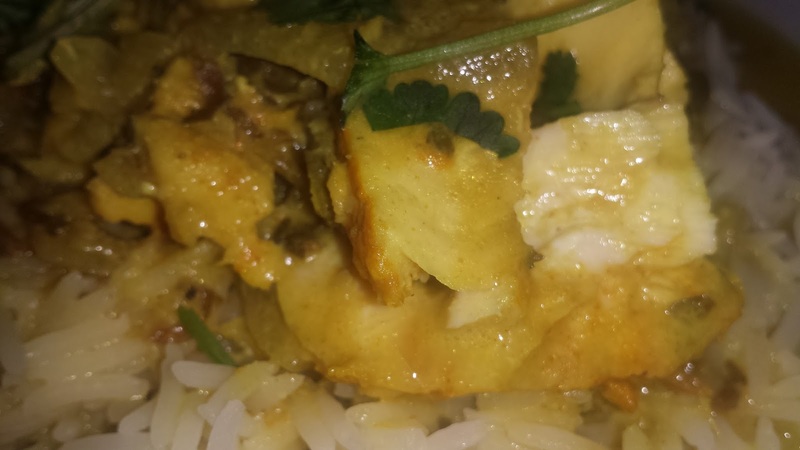 After passing various alternatives to my husband during the day, which consisted of Goan Fish Curry, Goan Mackerel Croquetas, Spicy Beef and capsicum Stir Fry or Green Fish Curry he opted for the Green Fish Curry. 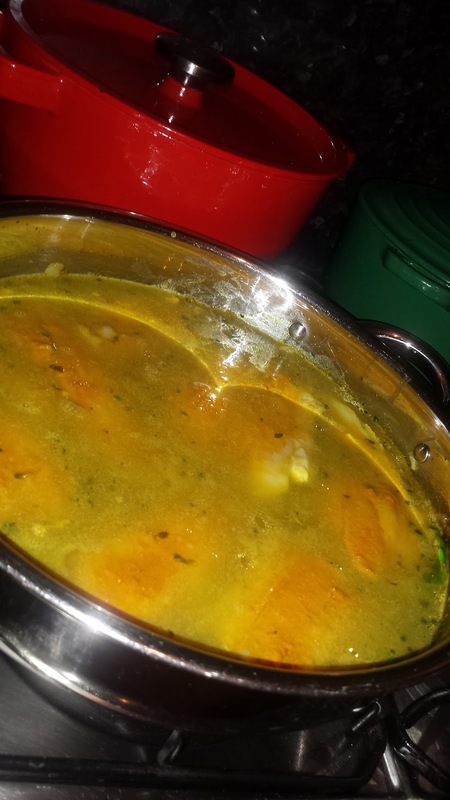 It appears that Goans love their curry and is a must in all homes and they rarely go with out it. Most people are under the impression that the curries are hot and also they only eat red curries, but this isn’t the case. They love green curry too. 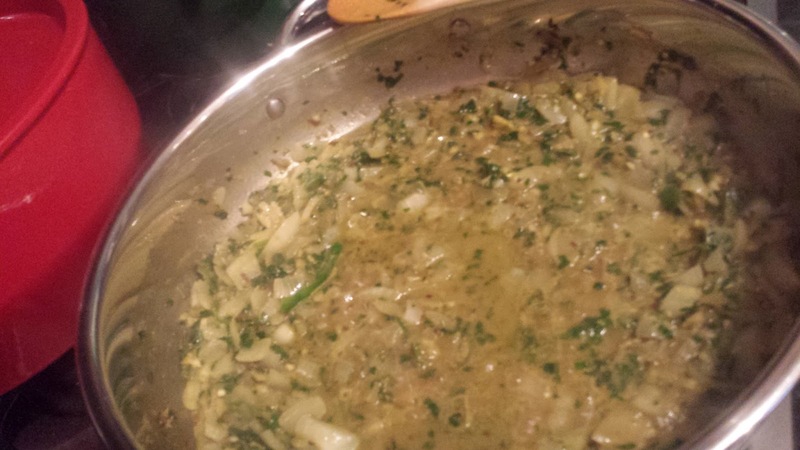 Curries are cooked in a mud pot but in the absence of that we will just use our usual pan….The recipe we used is linked in this blog and also on the web links and Bibliography page. 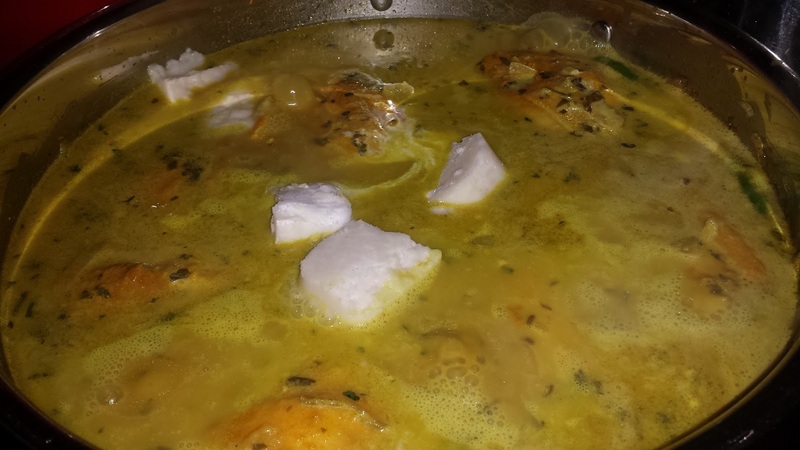 In the absence of fresh King Fish (Sumari) Ian chose good quality haddock…seasoned as the recipe suggests, waiting to be added to the Green Masala paste.. 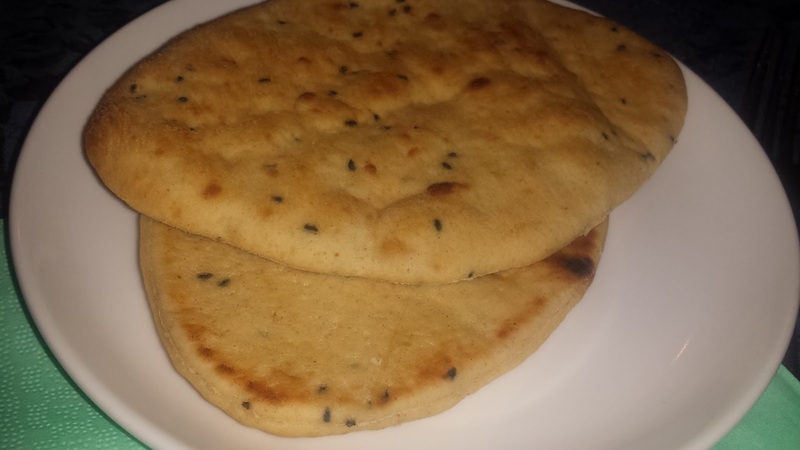 This dinner was all served with – again Basmati rice – (need some vegetables soon – wonder where tomorrow will lead), sprinkled with coriander leaves and Ian decide we needed some Naan bread. 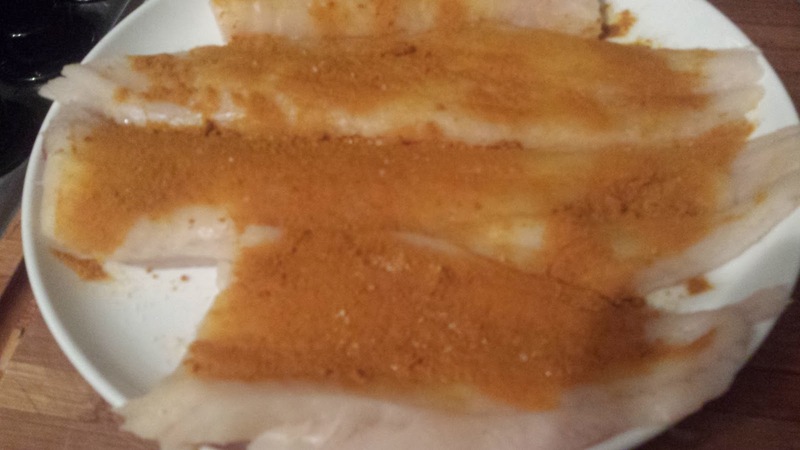 Family Verdict: Amazing , tasty , gorgeous dinner…Easy to prepare and cook and maybe just not enough of it, although I am told it was a kilo of fish used… The smells as I arrived home were exquisite and this would be something we would cook again. Tomorrow we are off to “Prince Edward Islands”….. Oooh err lets go and investigate.